The YDZ series is designed for the user who has small capacity needs, but requires long-term storage and low liquid nitrogen consumption in a convenient lightweight package. 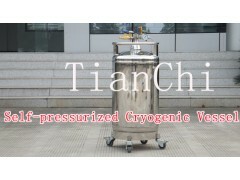 Self-pressurized cryogenic vessels may be mainly used for transporting, storing, transferring and supplementing liquid mediums (such as liquid nitrogen, liquid oxygen and liquid argon); and they may also be acted as the cold sources for other refrigerating units. The vessel is composed of the inner container, the outer shell, instruments and valves, in whose top location there are equipped with the pressure gauges to conveniently measure the inner pressure; and there are equipped with 2 safety valves to enhance the vessel operation safety. Exquisite packaging, strict protection, provide the most safe and effective products and services according to customer`s need..